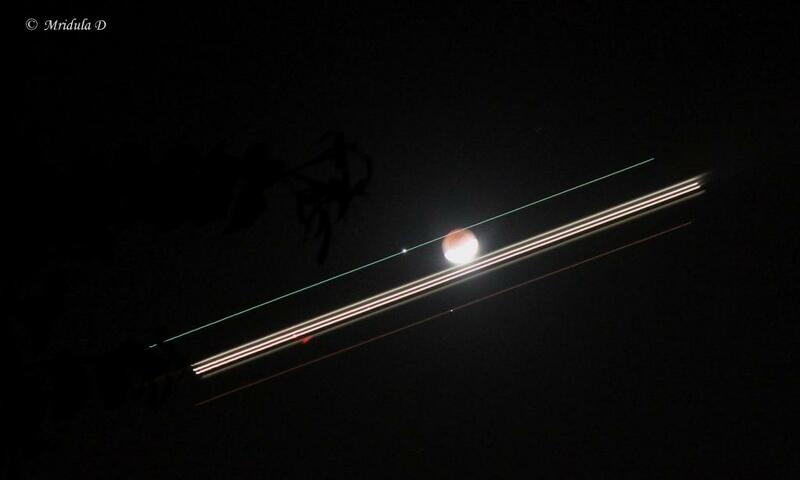 I finally managed to click a flight going across the Lunar Eclipse as well. When I first saw flights going across, I was not quick enough. Had to wait for about half an hour to get another plane in the frame. 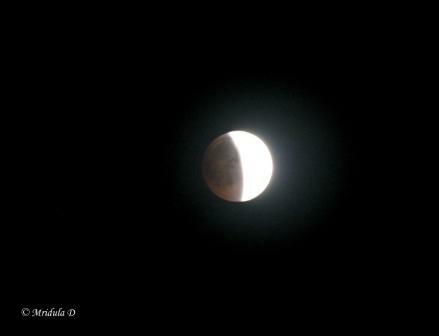 I have been lamenting that I do not have a zoom lens and there is a complete lunar eclipse today. 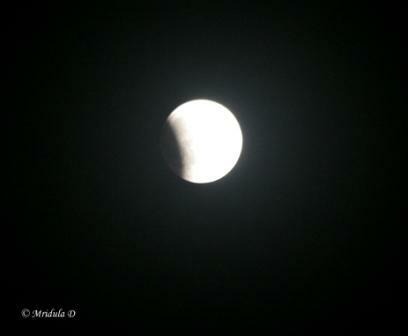 Well who said lunar eclipse will refuse to get clicked with a wide angle lens! 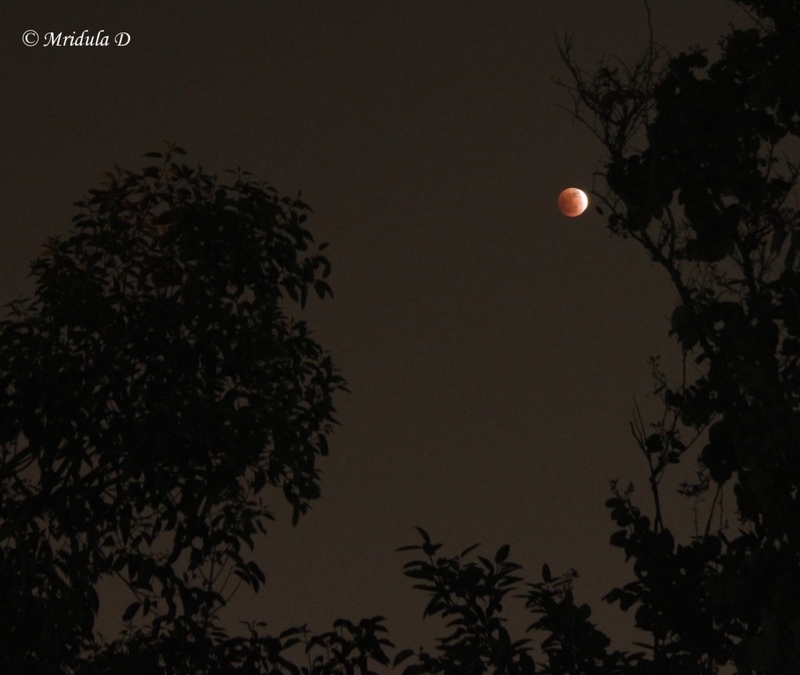 I decided to add this post to the Skywatch Friday as well. You cannot imagine how much I sweated to click even these pictures, my zoom lens needs servicing and it had to happen when one of the biggest phenomenons had to occur in the sky. What a Spectacle in the Sky! Zoom lens acting funny or not I had to click as I am not likely or unlikely to be around when such a show happens again. And shooting with a tripod is such a pain for me. Even in this pleasant weather I sweated a bucket. 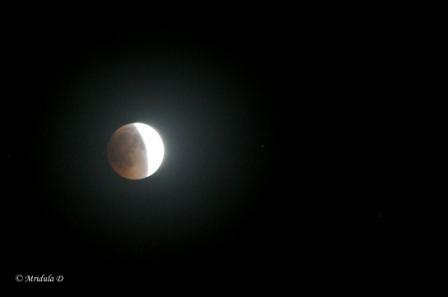 And it Got Even More Spectacular! I rarely curse in public forums but today I feel like making an exception. My lousy camera has also developed a quirk about emptying the battery too soon. But if you take out the battery and put it in again it works fine. But not when it is mounted on a tripod, the battery won’t come out. 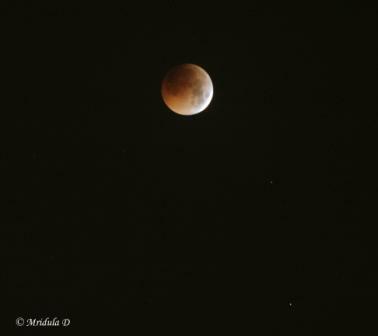 I had to take the camera out of the tripod and then take out the battery. Then I would put the battery in, put the camera back on the tripod and then adjust it again. Also focus again with a lens that is misbehaving. That is how I enjoyed watching the eclipse! God knows how many times I did this sequence and in the process sweated maybe two buckets. Was it worth it? Totally. As I said, I won’t be around to click the next big one. I know there would be spectacular pictures on the net but there is something about the pictures that you can call yours.